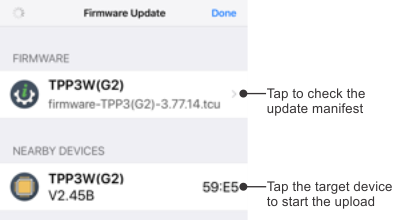 BLE firmware updates are supported by the Monitor/Loader (M/L) of the following Tibbo devices: EM2000, EM2001, TPP2(G2), and TPP3(G2). This support was added in V3 of the M/L. So, the minimum M/L version your device needs to run in order to be able to support BLE upgrades is V3.00B ("B" stands for BLE). Additionally, BLE updates require the WA2000 Wi-Fi/BLE add-on module to be attached. BLE upgrades can be used to upload new TiOS firmware, Tibbo BASIC/C application, and even the internal firmware and the internal Monitor/Loader of the WA2000! 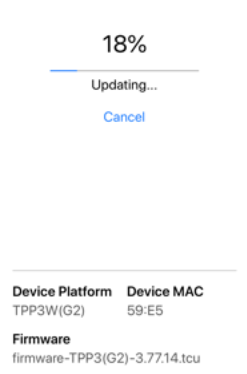 If the M/L of your device is too old to support BLE updates, you can update the M/L itself by running the Monitor/Loader Upgrader app. BLE updates are also referred to as over-the-air (OTA) updates. •You must have the file you will be sending into your device. BLE upgrades use Tibbo Composite Uncompressed (.TCU) firmware files. 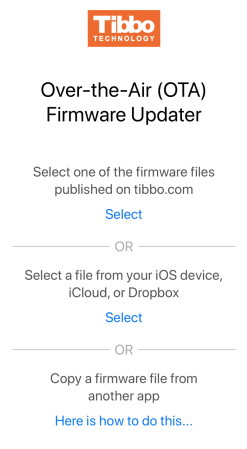 All TiOS firmware and related files are published here: http://tibbo.com/support/downloads/tios.html. You can also produce .TCU files using our online tool found at http://apps.tibbo.com/tc_generator/. 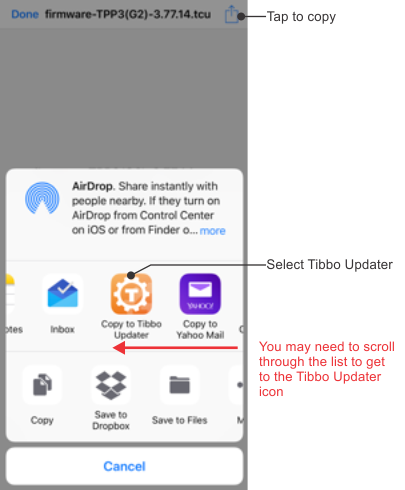 •You will have to install the Tibbo Updater app (available for iOS and Android) on your compatible device. oYou can "copy" (export, share) a .TCU file to the Tibbo Updater app from some other app that has this file. For example, you can email a .TCU file as an attachment and open this email in the email client app on your iOS/Android device. You can then "copy" the attached file to the Tibbo Updater app. •You will need to be able to push the MD button on your Tibbo device (or pull the MD line LOW). •Optional: you will benefit from observing the signals displayed by Status Green and Status Red LEDs of your Tibbo device. •Disconnect your Tibbo device from the Ethernet (this will allow it to enter the BLE update mode). •Turn your device off if it was on. Press and hold the MD button (or pull the MD line LOW) and apply power to your device. •Release the MD button (line). The Green status LED will turn on. •After about 15 seconds (the time allotted to attempting to establish an Ethernet link), the Green status LED will turn off, and the red status LED will turn on for about 2 seconds, indicating that the WA2000 is booting up. •After that, the Green status LED will be on again. This will indicate that your device is ready for a BLE update. •Open the email client on your Apple or Android device and browse to the email with a .TCU file attachment. Alternatively, access the file in some other manner that allows you to "copy" (export, share) the file to another application. For example, you can access the file via DropBox. The Updater app also allows you to open the file that you previously stored on your device. oIn that other app (such as an email client app), tap on the .TCU file and tap Copy) – your will be presented with exporting choices. oSelect the Tibbo Updater app (note that the app's icon may be "beyond the screen edge" and you may need to scroll through the list to get to the Updater). oOnce you tap on the Updater app's icon, you will be "teleported" into the Updater app. The app will be displaying the list of discovered Tibbo devices. Only the devices in the BLE update mode will appear on the list. If you followed the steps above, your Tibbo device should appear on the list. oThe app will start sending the file to the selected device. During the upload, keep your iOS device as close to the WA2000 as possible. oWhen the file upload completes, Tibbo device will enter the actual update mode. This is the "critical section" of the entire procedure. Do not disconnect power or reset your Tibbo device while the file is uploading or while in the "critical section" of the update procedure. Doing so may brick the hardware! oOnce the update completes your device will reboot automatically. For more information on various update modes and how the M/L selects and handles them, see Update Mode Selection Flowchart.